This area of open space near the middle of the village is one of our village’s greatest assets. 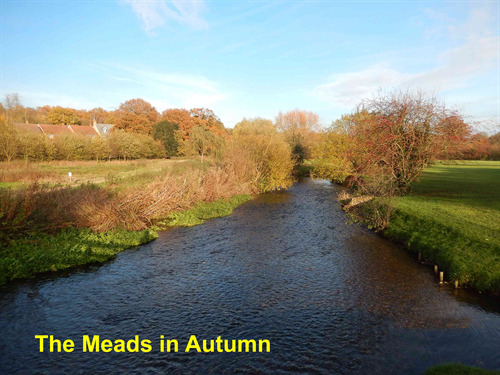 It offers a combination of semi-wild grassland on the north side of the river, a close-mown play and picnic area to the south, a Local Wildlife Site (The Dell), and the community orchard, with the River Lea running through the middle of the whole area. In earlier times, the land on either side of the river was a flood plain, marshy all year round and submerged in winter. As a result, the soil is rich and fertile and the water table is close to the surface. The Tithe Award Map of 1840 shows that the land on each side of the river was owned by the Dean of Westminster. It was tenanted by James Mardell but was also Lammas land, meaning that commoners were entitled to pasture between Lammas day (12 August) and 6 April, even if they did not have other rights to the land. Wheathampstead Parish Council bought this land (“six acres, three roods, 35 perches or thereabouts, together with land forming the bed and the River Lea so far as it runs through the said piece or parcel of land”) in October 1937 for the sum of £200. 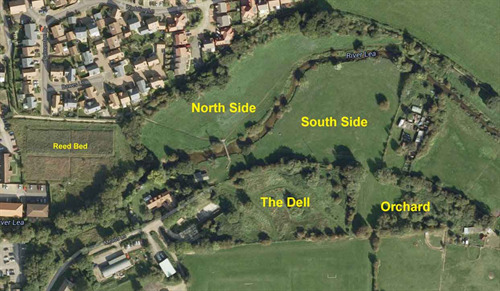 The area that is now The Dell and the community orchard was compulsorily purchased from Lord Cowper of Panshanger by the Board of Guardians in 1873 for the construction of the first sewage works in the village. The works were extended and modernised several times before they were closed in the late 1970s. 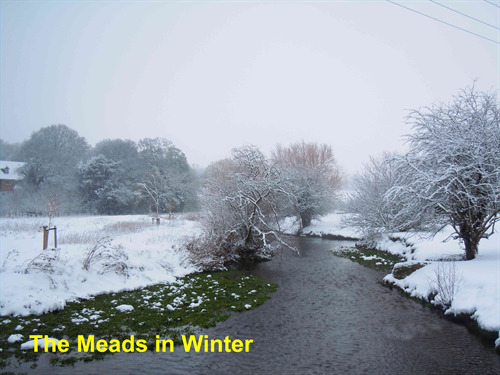 The Parish Council bought the land from the Thames Water Authority in 1983 for the sum of £2000. The site was then completely re-landscaped; this work was awarded First Prize in the Rural Section of the Hertfordshire Conservation Awards in 1991. The area on which the community orchard was planted in January 2014 was the easternmost section of the old sewage works, used to take any overflow of treated effluent. It is unsurprising that this land is now so fertile. The three mature trees were planted some sixty years ago by Arthur Wren, the manager of the sewage works. The new trees, a mix of apple and pear, are all Hertfordshire varieties. For the story of the community orchard, click here. The varieties of apple and pear that were planted in the orchard in January 2014 are all native Hertfordshire varieties. They were chosen to take account of pollination groups, the date when each variety should be picked, and when they should be eaten. Experience from other newly-planted orchards persuaded the Parish Council that it would be wise to keep the orchard locked for the first few years while the young trees were vulnerable to accidental or deliberate damage and until they grew to a good size. They are pruned twice a year to shape their growth. The dates given for picking the fruit, which has been placed on the orchard fence, are from the EEAOP catalogue (East of England Apples and Orchard Project). However, weather conditions this year (frost in March, drought in June and July) mean that some of these dates are unreliable and we will have to decide on the picking date for each tree as it becomes ready. The fruit will be put in a box by the gate as soon as it is picked, with information about the variety and how it should be stored — please help yourself. For a list of these dates, please click here. The balance between these varies from one open space to another, within an open space, and from time to time. Here, the priority is to encourage biodiversity of plants, grasses and insects. Visual appeal is important, while the permissive footpaths show the preferred access routes through the area. The vegetation is cut twice a year, in summer and late autumn, and the arisings are removed to reduce the fertility of the soil and so encourage the wild flowers. A “buffer strip” is left uncut along the river bank to protect small mammals and to provide shelter for fish. The trees in the two plantations on the north side are goat willow (or “sallow”) and were planted about twelve years ago. These plantations are thinned each year as the individual trees get bigger. There are several magnificent old oak trees alongside the bridleway at the northernmost edge of the area, together with some mature field maple. These may show the boundary of the original Lamer estate, though this has yet to be researched. The invasive holly here is being removed to reveal these great trees and to allow more light to reach the ground. On this side, the priority is to provide access to local people and visitors for picnics and play. The grass is close-mown throughout the summer and the area is kept as tidy as possible to promote its visual appeal. As a result, biodiversity is very limited but the area is hugely popular with families and dog-walkers. The village “Picnic on The Meads” is held here every year on the Saturday of Village Weekend (the second weekend in July). The building at the western end of this area was formerly a blacksmith’s forge. It is now used as a workshop and storage facility for the parish maintenance contractor and the many volunteers who help maintain the open spaces in the parish.